This is an exclusive polar bear photography tour and a rare opportunity. This cabin-based photo safari is specially designed to get you close to one of the world’s most magnificent predators in their natural habitat. Your journey will begin in Churchill, where you can unplug from the hustle and bustle of the 'everyday'. Escape to our intimate, remote and rustic private cabin complex for a complete experience in the North. Bring your camera and be ready to capture incredible Arctic wildlife including arctic foxes, hares, willow ptarmigan, wolverines and ofcourse, polar bears! On arrival to Winnipeg, spend the night in a 4-star boutique hotel close to the airport. This morning you will depart on a flight to Churchill, Manitoba. 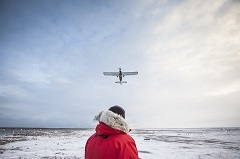 After landing, transfer and board a private charter flight to the Polar Bear Cabins. Enjoy the views below on this 50-minute flight where it is possible you might see caribous roaming the tundra! After checking in, the remainder of the day is at your leisure to explore the surroundings of this complex. 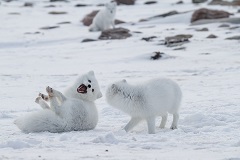 These three days are dedicated to observing and photographing polar bears and other arctic wildlife including arctic hares, arctic foxes, pine martens, willow ptarmigan, snowy owls, gyrfalcons, and wolverines in the wild! 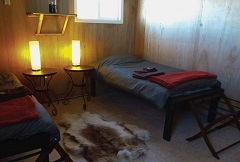 Your encounter with polar bears will almost be unreal; ground-level and up-close within the Polar Bear Cabins complex. Behind an unobtrusive electric fence, they are known to wander right up to the fence! You will be in the company of expert guides when taking short treks over the frozen tundra and shown extraordinary viewing spots! 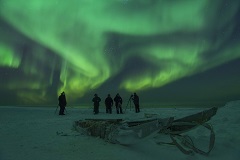 If the weather permits, you can spend your nights enjoying the phenomenal Northern Lights that blanket the sky with blended yellow and green rays. Spend the morning capturing your final moments with the polar bears before flying back to Churchill, and then Winnipeg. On arrival, there will be a hotel arranged for you near the airport where you can rest for the night. Your tour comes to an end today as you depart for your next adventure. Rustic, remote and accessible by air, Polar Bear Cabins rest on the shores of Hudson Bay. These simple cabins are surrounded by an electric fence, offering a comfortable and safe home in the heart of polar bear country. Allowing for a maximum of eight guests, with four guest cabins and a central dining/lounge cabin, the Polar Bear Cabins create a private and intimate polar bear viewing experience. Internal airfares can be arranged with us for your convenience, from CAD$1999 (+$99.95 tax) per person for 2018 departures and from CAD$1737 (+$87 tax) per person for 2019 departures, from Winnipeg to Churchill. Maximum group size is 8 passengers.